Why You Should Choose This Deepcut Wood Cabin for Your Family. These ‘Deepcut’ log cabins are amazing to look at and even more amazing to own. The doors and windows, with their Georgian or Classic style, allows natural light to flood in giving the impression of actually being in your garden. The range of uses for this building is immense but for a sunroom for relaxing with your friends and family takes some beating. A nice barbecue and some drinks on a warm summer evening is a lovely thought. Option for insulated roofs and with the double glazing, supplied as standard, will make this a cosy room for all year round use. Amazing design is hard to beat and these ‘Deepcut’ log cabins to buy oozes great design. Within the remit of the design was the type of material used and there could only be one choice and that is Nordic timber. 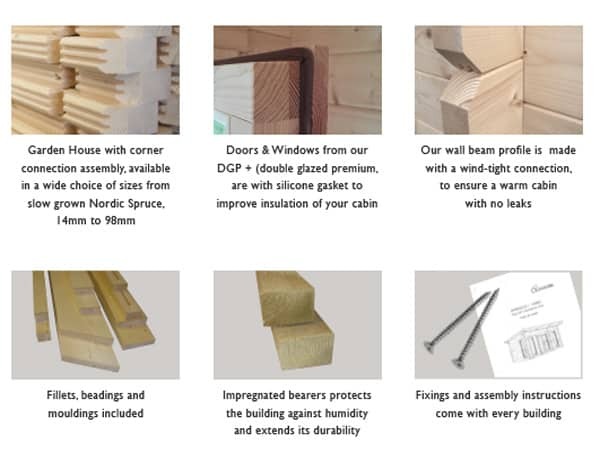 Renowned by the Swedes this slow-growing timber is the backbone for their our door buildings. Used by generations of Swedes you can benefit from their experience in your garden where it will brush off our UK weather with no trouble at all. The superb doors and windows are soundly made and, naturally are double glazed as standard. Also as standard are Georgian windows bars so you can adapt this log cabin to a Georgian effect building. It’s your choice! Cheap Materials Have No Place on These Log Cabins. The quality of timber used is paramount and no shortcuts or compromises are made. You won’t find any chipboard, OSB board or other ‘nasties’ in these superb log buildings. They may be a little more expensive than the cheap ‘pile them high’ cabins elsewhere but it’s important to make the right decision. The best value log cabin is not always the cheapest. The doors and windows are designed for our modern life and the changes in our weather. Besides the right materials being used it’s important that the timber comes from sustainable resources and these do as standard. Properly kiln dried as well to suit its environment. The good design of this garden cabin makes it relatively easy to assemble if you choose to do it your self. To ensure the ease of doing this the design of these log cabins were assembled at the factory to make sure all parts fit correctly. They are then barcoded and flat packed before being shipped to the end user. All these stages are designed to make life easy. If you would like this work done for you then we offer a log cabin assembly service where all the work is done for you. They will assemble the log cabin, felt and make it watertight so you can enjoy this versatile building sooner rather than later. You know it makes sense! It’s quite easy to be taken in by the flashy websites on the ‘net’ and also maybe a glossy brochure however the best way to know how good a log cabin is to view one. This is why we have two (2) UK display sites in Surrey, close to the M25. 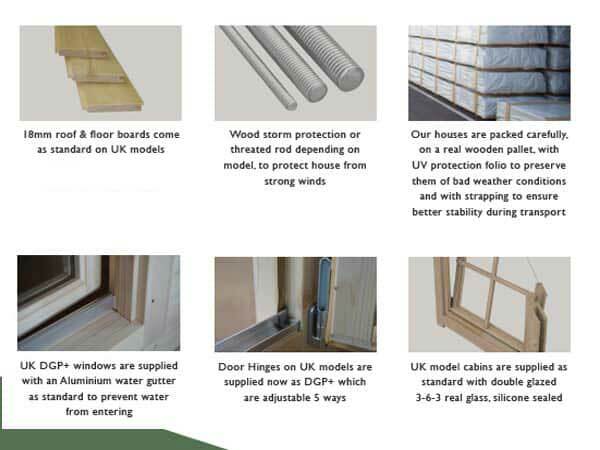 Here you can see examples of our Trentan log cabins so you can make a logical decision about the build quality of these buildings. Whilst we don’t have a massive range you can get a very good idea of what to expect. UNLIKE many companies which sell on the web with no facilities for viewing. With those companies, you are buying ‘blind’. Is it worth taking a risk with your investment? By being ‘touchy-feely’ with the log cabin you can be sure it will meet your needs. 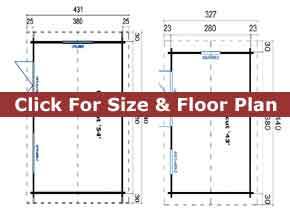 The standard sizes and layouts on these buildings are the most economical way of buying a new building but if they don’t suit your space or your layout then what do you do? We have the answer with the bespoke range of log cabins which can be made to suit you in connection with size, layout and cladding. This means that your new log cabin will be perfect for you and your family. What a great service! This philosophy has evolved over 34 years as 1st Choice, a family business, has fine-tuned its offering to the public. This really is why we believe the customer is number one. Our Ethos is ‘Make to a Standard – NOT down to a price’. 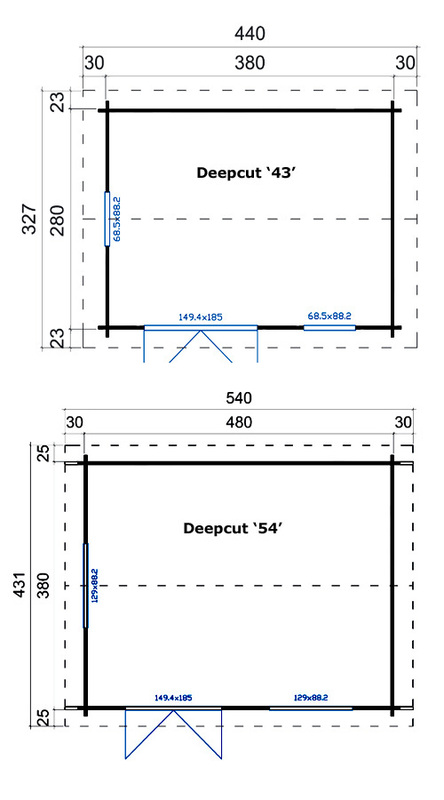 Size: Two sizes of Deepcut cabins available – 4.8m x 3.8m (15¾ft x 12¾ft nominal) and 3.8m x 2.8m (12¾ft x 9¼ft) Apex or cable Style. Note this is the external size of the body of the cabin. The lugs extend 100mm on each corner making the overall size (as most other companies quote) 200m larger. We mention this so you know you are comparing ‘eggs with eggs’. Approximate clear internal size will be approx 4.7m x 3.7 or 3.7m x 2.7m. Please check with us if internal size is crucial. Cladding: Standard logs are 44mm thick, interlock into each other and are cut from a top grade of Nordic Timber. This ensures the maximum stability and longevity of the timber. The log profile has designed wind-tight connections to ensure a superior resistance against wind. Untreated. Kiln dried timber from sustainable sources. Doors: Joinery quality double glazed double doors 1494mm wide x 1850mm high (58½in x 72½in) – approx sizes. Easy adjust hinges complete with gasket seals, fitted silver finish door handles, cylinder lock and two unique keys. Low doors sills giving you easier access into your log cabin. Supplied untreated. Beware of doors with single glazing or excessively high door sills. Windows: Two (2) Joinery quality inward opening windows included as standard. Size of each window is 129cm wide x 88cm high (50¾in x 34½in). Complete with easy adjust hinges, silicon gasket seals and delightful silver finish window handles. Supplied untreated as standard. Double glazed as standard NOT single glazed. Georgian window bars included free as standard. Erection: Our log buildings are supplied in kit form for self assembly. Option for assembly through a third party if required. If being built you would require a concrete base or solid and level paving slab base. Optionally, we have an option for building a base for you. These wooden cabins are assembled by interlocking the panels for ease of taking it down again if you decide to move. We have a log cabins UK for sale display area near Woking in Surrey where you can inspect examples of the Trentan range of log cabins for your self. It’s always good advice to inspect a cabin before buying so you don’t get sold a ‘pup’ and waste your money.